Ken Cain of Georgia, USA, expresses his horror, Saturday, June 16, 2007, at the little-publicised bombing tactics used by the Allies in World War II. I RECENTLY watched an interview with you which was posted on YouTube regarding Heinrich Himmler and his involvement with the concentration camps. Your insights were absolutely fascinating. Above all I am encouraged by your comments on the necessity that historians must (but rarely do) examine all sides of any event. Specifically your mentioning of the understandable attitude of the German hierarchy following a particular R.A.F. fire-bombing which killed 20,000 civilians in one night. Years ago I read a passage in a World War II volume (I do not remember which) that described a jointly planned raid carried out by the R.A.F. and the U.S.A.A.F. 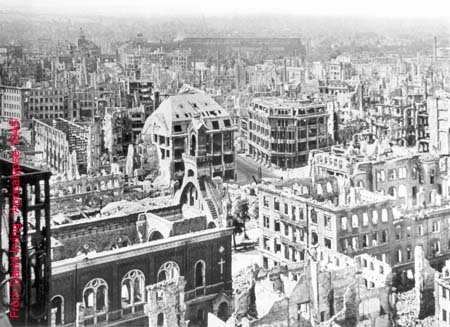 in which the British fire-bombed a German city at night. The following day the Americans returned with high-explosive loads to intentionally kill the rescue workers who swarmed over the ruins looking for survivors. I was utterly appalled at reading such things. I could also not recall ever being taught any of this in school. Often I try to convey to people my horror of this and other instances. Almost always I observe their eyes beginning to blink uncontrollably as they look off in the distance and begin mindlessly spouting a scripted rationalization fed to them by the very history teachers I use to admire. I would like to express my true admiration for the journey you have taken.